I love your website.. Just brilliant. I always thought I was alone with this addiction. I started using when I was 13 years old. I am now 53! Forty years of slathering grease on my lips. I started with simple Blistex chapstick and gradually moved on to the heroin of chapsticks: Blistex DCT (not a stick, it’s a little pot of chemicals). I have chapstick everywhere…. Several in my purse, my nightstand, my desk…. I have to use it every couple of hours during the day and once or twice in the middle of the night. A few times I left home without it, panicked, turned around and drove back to retrieve my stash. I worry about running out so I stock up. 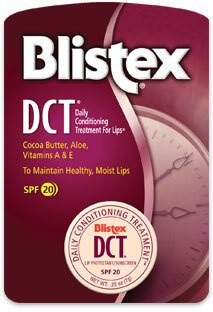 Most retail stores have stopped selling this DCT brand (my chapstick of choice) so I have to order it on line from amazon. I have about 20 tubs at the moment. My husband teases me about my chapstick use and doesn’t believe it’s an addiction. My family look at me strangely when I whip out my goop at the dinner table. My friends think it’s just nerves… But I know the truth: I am terrified of withdrawal. Why? I went through withdrawal twice years ago and it was a nightmare. I sensed my chapstick use was excessive so I thought it was time to break the habit. I tried to stop cold turkey. To my horror, each day my lips got drier and drier and cracked and bled and shriveled. They looked and felt awful.This went on for 2 weeks and did not get better. So I finally gave in. I stuck my finger into the blistex pot, scooped some lifesaving goop and slathered it on my painful lips. Instant relief! All symptoms disappeared. I felt normal again. Since my terrible withdrawal experience, I tried to switch brands. Something more natural from the health food store. They don’t work! Only DCT does the job. I just wanted to share my story to emphasize that this addiction is real and can last a lifetime. Although I am fearful about trying to stop again I may try your 12 step program. Thanks for creating the website.. I had a good laugh and then here I am fessin’ up! I’m glad you found something on our site humorous, though I’m not sure what that would be. But, your story certainly illustrates the long-term dangers of using lip balms. In other words, once you start you’re hooked! For the rest of your life! Think we’re joking? Have you forgotten Debbie’s story and her 40 year addiction? Debbie’s story about only feeling “normal” while taking lip balm is not uncommon, especially after such a long time of usage. Given that weaning and cold turkey don’t seem to be effective, I’ve referred Debbie to a local LBA chapter where she can get the help she so desperately needs. Ask the Addict: Why does it Matter? I saw your Blistex report page. Seriously? Quit using Blistex all together just because you can use it more than 4 times a day?? Why does it matter?! Because the next day it’s five times, and the day after that six. And so on and so on. Next thing you know you’re using a tube a day! It doesn’t happen to everyone, but for us addicts we are all too familiar with the downward spiral.